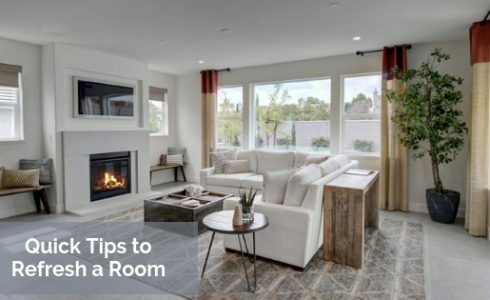 Whether you’re moving into your new Discovery Home in one of our many Bay Area communities or you simply want to refresh a room, you can update any room without spending a lot of time and money. Here are a few guidelines to follow to get you started. A common reason for wanting to refresh a room is because the space feels outdated. But before you start getting rid of everything and start completely from scratch, stop and take stock of the room. Identify the room’s purpose and whether it’s meeting that goal. Sometimes all a room needs are a handful of fresh accessories or simply rearranging the furniture. If you decide to start from scratch, focus on a theme that will coordinate with the rest of your home. It doesn’t have to match perfectly but start with complimentary colors and textures that are found in other parts of your home. Doing this will allow you to have a room with a bit of personality while still looking like it fits as part of your home. Now that you’ve identified the room’s purpose and selected a cohesive theme, it’s time accessorize! We split this into two parts for a reason: you don’t have rush to the store yet! First, look around your other rooms and see if there are a few select pieces that will also work in your newly refreshed room. Get creative with what you have on hand! Trays, baskets, candles, or even plants can add new life into the room. Hang vintage plates or on the wall or frame printed scrapbook paper or fabric for a unique piece of wall art. Or consider updating the family photos currently on display in the room. You’ll be amazed at the different ways you can repurpose the items you already own. Still need a few new items after shopping your house? Now it’s time to head to the store. Keep your accessory updates small: think mirrors, throw pillows, lamps or rugs. Update the hardware on dressers and cabinets for an instant and inexpensive change. Look for pieces that will fit the personality of the room. Above all, make sure you design a room that feels comfortable and complements how your family lives. Magazines and blogs are great places to get ideas to start but remember that this is a home you’ll be living in so style it in a what that will make you smile whenever you walk in.